There is a SEVERAL “United States” in the body of the Constitution and the 13th Amendment. There is a SINGULAR (probably “national”) United States in the 14th Amendment. The SEVERAL “United States” seems to most likely signify the several States of the Union and may (or may not) be a “shorthand” expression that’s virtually synonymous with the CONFEDERATION and UNION styled “The United States of America”. Just as there are (at least) two “United States” (several and singular), there are (at least) two USAs: “The United States of America” (created by the Articles of Confederation) and “United States of America” (which appears to be a statutory USA that is now deemed (at least by Black’s) to be synonymous with the singular “United States”. The SINGULAR “United States” (first seen clearly in the 14th Amendment) appears to be a NATIONAL entity that has become the bane of our current existence. 1. The “constitution of The United States of America” is the document that created/constituted “The United States of America”. The proper name of that “constitution” is the “Articles of Confederation” of A.D. 1781. 2. “The Constitution of the United States” is the document that created/constituted the “United States”. That Constitution was not given an “official” name within that Constitution but has come to be called the “Constitution of the United States” (or “The Constitution of the United States”) and was first ratified by the People in A.D. 1789. But there may be a second “constitution” also referred to as “The (the?) Constitution of the United States” that was first signed by the Congress in A.D. 1787. More confusion and ambiguity, hmm? But if there is a “constitution of A.D. 1787 and also of A.D. 1789, it may make a big difference whether you refer to the “Constitution of A.D.1787” or the “Constitution of A.D. 1789”. The words of both documents are identical, but the authority of each document derives from a completely different source: one from Congress (A.D. 1787) the other from the People (A.D. 1789). Under the “Constitution of A.D. 1787,” the Congress might be the sovereign. Under the “Constitution of A.D. 1789,” the People of the several States of the Union are the sovereigns. The reason I believe there may be two “constitutions” is that I several years ago, I was researching on Manta.com (which lists millions of corporations) and turned up “Government of the United States” and/or “United States” which Manta.com (based on data from Dunn & Bradstreet) had declared to be a corporation which had been “in business” since A.D. 1787. But A.D. 1787 is the year that the Constitution was proposed by Congress. However, under Article VII of that Constitution, the Constitution and resulting “United States” and resulting government would not be ratified and thereby established until the “Conventions of nine States” had ratified the proposed Constitution. So far as I know, the 9th State’s convention didn’t ratify until A.D. 1789. That tells me that the Constitution was merely a proposal and without any lawful authority until A.D.1789. Thus, the de jure “government of the United States” could not have existed prior to A.D. 1789. Therefore, either Manta.com and D&B were mistaken when they alleged that the “Government of the United States” is a corporation that’s been “in business” since A.D. 1787–or, it is currently presumed that we have two constitutions: one authorized by Congress in A.D. 1787 and another ratified by the People of the several States of the Union in A.D. 1789. If it were true that there are two “constitutions,” whenever you unwittingly acted under the authority of the Constitution of A.D. 1787, you might acting under the authority of Congress. Congress would be the sovereign and you would be a subject. On the other hand, if you expressly acted under the authority of the Constitution of A.D. 1789, you’d be acting under the authority of the People and–as one of the People–you would be an individual sovereign and the government would be your fiduciary. This hypothesis is based on fairly flimsy evidence. I’m not betting my life that the foregoing is true, but I think it is. 3. “The United States of America” created/constituted by the Articles of Confederation include only the States of the Union. So far as I know, there is no proviso for territories or for a federal district (that became Washington DC) in the Articles of Confederation. I therefore presume that that to this day, there are no territories or Washington DC within “The United States of America”. I presume that means there is no Zip Code within “The United States of America”. 4. The “United States” created/constituted by the “The Constitution of the United States” of A.D. 1789 (and/or A.D. 1787) includes territories and what became Washington DC. Within the States of the Union the resulting “federal”(?) government has only limited powers. Within the territories and Washington DC, that government has unlimited powers. So far as I can see, the Zip Code applies within the territories and Washington DC. It’s not necessarily true, but it’s conceivable that use of the Zip Code is deemed evidence that you are acting as a subject within the “United States” rather than as an individual sovereign within “The United States of America”. 5. I can’t prove it, but I strongly suspect that the relationship between the “The United States of America” (created by the Articles) and the “United States” (created by the “Constitution(s)”) is revealed in the Preamble to the Constitution first ratified in A.D. 1789. That Preamble declares in part, “We the People of the United States” (which I presume to mean the People of the several “United States” which comprised the Union styled “The United States of America”) . . . “do ordain and establish this Constitution for the United States of America.” The trouble starts right there. If the fools had written “for The United States of America” (the proper name of the perpetual Union created by the Articles), a whole lot of subsequent confusion might’ve been avoided. By writing “the United States of America” the Founders left open the possibility that the proper name for the “Constitution” might be “The Constitution for the United States of America”. Some people believe that’s true. I do not. I always stand to be corrected, but if my interpretation is roughly correct, then the “United States” and general government created by “The Constitution of the United States” of A.D. 1789 were intended to act as a fiduciary for the benefit of “The United States of America”–the Confederation and States of the Union and intended beneficiary. Thus, I see the “Constitution” is a trust indenture wherein We the People are the grantors, “The United States of America” is the beneficiary and the “United States” is the fiduciary. A principle duty of the fiduciary/”United States” is to administer the territories and Washington DC which had been acquired and/or created prior to adoption of the Constitution, but for which there was no proviso in the Articles of Confederation. If all of this isn’t sufficiently confusing, take a look at 28 USC 81-131 which offers definitions of the “states”. I believe these code sections (adopted in A.D. 1948) define the territorial “states” of the singular “United States” rather than the States of the Union of “The United States of America”. In all of this confusion, one fact stands out as reliable: the proper name for the confederation and perpetual Union created by the Articles of Confederation and made “more perfect” by the Constitution is “The United States of America“. It can’t be denied or refuted. Because that Union was expressly declared to be “perpetual,” it cannot have been lawfully disposed of or otherwise terminated or abandoned over the past two centuries. So long as you can successfully assert that you are within the “plane” or “venue” of “The United States of America,” you might enjoy a substantial defense against the purported authority of the singular/national “United States”. All of which is PRECISELY why it’s intended use is defined at each incident of usage within the codes/statutes. Interesting news today about the real name of Mexico..Seems they have a similar issue. 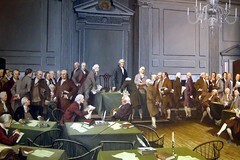 Representatives of the several States convened, with the intent of creating a constitution, in AD 1787. It could be that Dun & Bradstreet considers this the first act of the new government. They would say the private company with governmental powers now in DC has been “in business” since that year, because this entity is considered the privatized continuation of the People’s trust then established. The text of the Constitution dates itself. “Done in Convention by the Unanimous Consent of the States present the Seventeenth Day of September in the Year of our Lord one thousand seven hundred and Eighty seven and of the Independence of the United States of America the Twelfth In witness whereof We have hereunto subscribed our Names.” Since no one has produced a Constitution bearing a different date, it’s probably okay to assume there is only one. Notice also that, according to this excerpt, “the United States of America ” was (at least) 11 years old as of AD 1787. Old Man ‘organic constitution’ emancipates Junior with the 14th amendment and tells the world that Junior is on his own and cannot rely upon the Old Man to underwrite his debts. Since the Old Man considers Junior to be a rebellious sort (in insurrection as it were) he makes a provision that the People who follow Junior may not question the validity of the debts they incur. To the People who followed Junior: Your constitution IS the 14th amendment and subsequent amendments. There are no provisions of the organic constitution that predate the 14th amendment that have any Authority at all. Congress has whatever power needed to enforce any provision of the 14th amendment and the ONLY provision that is spelled out is YOU MAY NOT QUESTION THE VALIDITY OF THE DEBT. What separates Juniors followers from the Old Man’s? The latter know of 15 Stat 223 (chap 249), can visualize what it means and act upon the instructions given. The Old Man’s debt? It has been stuck at $346,681,016 since 1878 (10 years after the 14th) or the amount of U.S. currency notes outstanding. Juniors debt? $12, 295,467,751,995.58 and climbing at $3.87 billion daily or $51,907 per follower. Junior is in it for the control. It gives him a rush. I disagree. The Articles may be amended, but they are still in effect. In the Revised Statutes of A.D. 1875 (ten years after the 14th was ratified) the Congress recognized that four documents (the Declaration (A.D. 1776; the Articles of Confederation (A.D. 1781); the Northwest Ordinance (A.D. 1787); and the Constitution (ratified in A.D. 1789) comprise “The Organic Law of The United States of America”. As of A.D. 1875, the Congress viewed all four of those documents as of equal authority. The Constitution may have amended the Article to some degree, but as seen in the Preamble the Constitution’s first purposes was “to form a more perfect Union”. Thus, the Constitution was not intended to replace the Articles and their creation (“The United States of America”) but only make that perpetual Union “more perfect”. Under the terms of the Preamble, the Union is still supposed to be in effect. I didn’t suggest that the Articles of Confederation were superseded by the U.S. constitution. That was Juniors Appeals court in California’s 5th district. For the vast majority of Americans neither the Articles of Confederation nor the ORGANIC U.S. constitution have any effect (other than perhaps the PERCEPTION that they are still part of the Law of the Land). An oath to the constitution is an oath to the 14th amendment and after. I developed a fever just reading that opinion! I knew the day it would come when the black robes would begin to tackle and dismantle what is left of our “unlienable” rights. At a very first glance and preliminary point, the gentleman should have challenged the motive and probable cause of the stop. Also, I think he contradicted himself regarding the assertion that he is not engaged in commerce if he was traveling to a job site as a contractor. There are other issues that need to be addressed but right now I am reeling from this opinion. Hopefully this will give your incentive to go back and review your conclusions from other court decisions. In my view the only reason to read any court decision is to determine how skilful the author is at stretching the truth. At common law a single judge has only the authority to release or hold over till trial. Any other decision that a single judge comes to is merely an opinion and has no authority at law. Ordered That the ratifications of the constitution of the United States transmitted to Congress be referred to a committee  to examine the same and report an Act to Congress for putting the said constitution into operation in pursuance of the resolutions of the late federal Convention. Congress assembled present New Hampshire Massachusetts Connecticut New York New Jersey Pennsylvania Virginia North Carolina South Carolina and Georgia and from Rhode island Mr [Peleg] Arnold and from Delaware Mr [Dyre] Kearny. Whereas the Convention assembled in Philadelphia pursuant to the resolution of Congress of the 21st of February 1787 did on the 17th of September of the same year report to the United States in Congress assembled a constitution for the people of the United States, whereupon Congress on the 28 of the same September did resolve unanimously “That the said report with the resolutions and letter accompanying the same be transmitted to the several legislatures in order to be submitted to a convention of Delegates chosen in each state by the people thereof in conformity to the resolves of the convention made and provided in that case” And whereas the constitution so reported by the Convention and by Congress transmitted to the several legislatures has been ratified in the manner therein declared to be sufficient for the establishment of the same and such ratifications duly authenticated have been received by Congress and are filed in the Office of the Secretary therefore Resolved That the first Wednesday in January next be the day for appointing Electors in the several states, which before the said day shall have ratified the said constitution; that the first Wednesday in February next be the day for the electors to assemble in their respective states and vote for a president; and that the first Wednesday in March next be the time and the present seat of Congress the place for commencing proceedings under the said constitution. See the Hooven & Allison Co. vs Evatt court case of 1945 for the 3 definitions of United States. Definitions that include the term being defined remind me of Lewis Carroll, for some reason. The sovereign United States mentioned in the circular definition we have here, i.e. “the territory over which the sovereignty of the United States extends,” could essentially reduce to Congress in its administrative capacity. Or, it could be a sort of “shell” entity originally created by Congress (probably during Reconstruction), for certain holdings and territorial administration, which was later privatized (probably in the 1930s bankruptcy receivership) to become the “private company” Dun & Bradstreet has listed. Either way, this would be the same United States which 14th Amendment citizens have signed up to be “subject to the jurisdiction” of. Where is your federal paystub? Good point regarding court opinion rulings. I was able to get in contact with Bruce Halajian, well at least the individual on the other end of the phone admitted to being addressed by that particular name. Anyhow, there is more to the story, from his perspective, than the facts presented in that opinion he says. He told me that the truck in questions was bearing license plates, and that the registration has expired within just a few days from the stop. This is a critical point in my view. He says he admitted that he was in transit to a job site, which in my view gives the court given the instant monetary system the presumption Mr. Halajian may be a merchant engaged in the pursuit of profit. This is one example of a case that is set up to create really bad precedent. Please re read this explanation as often as you require to unscramble the intentional confusion public education and public relations departments of corporations have programmed confusion into your mind on this subject. Having mental clarity and emotional calm makes all the difference in defending your unalienable Rights. All students of the U.S.A. compared to the U.S. should note and find for themselves the eleven instances wherein the written document Constitution of 1787 appears the distinction “this constitution”. That term refers to the document. In contrast the phrase “the constitution of the United States” also appears in the same document. Note also that this is the term “the constitution of the United States” used in the Article II oath, to orally “swear in” a President of the United States. And also note that the oral oath combines in verbiage the President of the United States and also the President of the United States of America. So students can see both Presidents are combined under the oath. However conspicuously missing is any reference to “this constitution” (the document) in the oath. From this we can observe no oath has ever been taken by the executive officer the President of the United States of America or the legislative officer the President of the United States, to “support THIS constitution”, the document. to make all laws which shall be necessary and proper for carrying into Execution the foregoing Powers…”, …it becomes obvious that the United States is particular place(s), within the United States of America, and that the United States does not comprise (or “constitute”) the entirety of the places within the United States of America. Article VI describes “this constitution” to be the supreme law of the land. Also that Senators and representatives and members of the State Legislatures and all executive and judicial officers of the United States and the several States, “shall be bound by Oath of Affirmation, to support THIS constitution….”. All students should read the oaths of any officer of government, and realize the words “THIS constitution” is no part of their oath. Such omission means the written document “this” constitution, remains un-adopted by federal and State officers, who do swear an oath to support “this (written) constitution of the United States”. Because there are two unions: the first union being sovereign, independent and perpetual, the Confederate union is “the United States of America”; and the second dependent non sovereign union of federal States, called “the United States”, the first remains and the second is owned by the first, the United States of America. It is the second union for which at Article I – “All legislative power herein granted shall be vested in A Congress of the United States….” That is THE Congress which legislates for property owned by and ceded to the United States of America. That is the Congress which creates “Citizens”, “citizens” who are “residents” of States of the United States, (Amendment 14) WHO BY THEIR OWN SWORN ADMISSION SAY they inhabit property owned by the USA. The owner of property may legislate over or “exercise exclusive Legislation in all Cases whatsoever, over such District….” that it owns. One closely held secret of State is that the “constitution of the United States”, does not mean the written document, rather it refers to the territory, lands and buildings which comprise or “constitute” the United States. The United States of America owns certain lands and buildings within the Confederate States which are called “the United States”, and A Congress has exclusive legislative authority over that land, those places and buildings which it owns. State of California the dependent second more perfect union State i.e. owned district(s) which are specific places within California are owned by the USA and the laws of A Congress are supreme there. Such State is populated with people who “reside” thereon, or who knowing no better CLAIM they reside there, and are thereby subjects of the law of the owner of that land. California the Confederate State is everything else in California, and is populated by free inhabitants whether they know it or not. The English Common Law is the law of those Confederate States and of those non federal lands within those States. The Common Law is the unwritten law of the inhabitants of Confederate States. pigeon hole him into his adversary’s legislative jurisdiction. Know our Organic Laws and be free of written government legislation if you know where you live and where the United States is located. The Organic Laws will teach you these facts. Constitution of the United States”. I am surprised you did not pick up on or comment on the uncapitalized “u” in the word “united” in the original document and correctly reproduced in the early printings of the Declaration. I keep hoping that I’m not to crude in my analyses, too . . . because I’m also still learning.